Dunnottar Castle is one of the most visited and photographed of our Scottish Castles along with Eilean Donan. For Stefano Bagnasco, an avid traveller from Italy and lover of Scotland, Eilean Donan is such an impressive place but it was Dunnottar that was the great surprise and excited him even more. 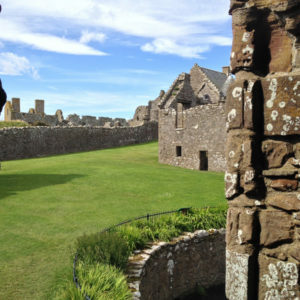 We’re delighted to have Stefano share his experience of this great medieval fortress on the south Aberdeenshire Coast. I was struck from the very beginning when I followed the small road that apparently leads to nowhere, since the castle is not immediately visible but appears on the horizon little by little as you come closer. It rises in a unique and strategical position, fundamental to its history as well as Scotland’s. It’s found on a rocky buttress perched over the North Sea and connected to the mainland by a narrow and rather steep path. We’re in the region of Aberdeenshire just outside of Stonehaven, a town about thirty kilometres from Aberdeen. For this reason I found it to be an ideal one day excursion to explore Scottish Castles. This fortress had a key role in the history of Scotland as well as the United Kingdom. As a matter of fact, starting from the end of the twelfth century the Scottish and English armies competed with each other; a key episode occurred in 1297 when William Wallace imprisoned English soldiers inside the chapel and then set it on fire. During the following centuries the real Castle of Dunnottar was built and because of its privileged position it became the custodian of the Scottish Crown Jewels (“Honours of Scotland”). In 1652 the long, bloody battle with troops led by Cromwell raged. He intended to conquer the castle, and above all, its priceless treasures. However, after the surrender, the English warlord was unable to find the booty; in fact, the jewels had been transported out of the castle with a ploy and buried below the floor in the church of Kinneff. In 1686 another tragic massacre occurred with the imprisonment and killing of 167 people guilty of not acknowledging the King’s autonomy with respect to the Church’s power. Centuries later the Castle went into decline and a state of abandon. Nevertheless, the present day ruins tell much more than what one can see and make this venue unique. Before entering the castle, I relished what remains of the fortress and followed the path along the coast from one end to the other. On the left, looking at the Castle in the direction of Stonehaven I could catch a distant glimpse of the ”War Memorial”. This monument commemorates the World Wars and the war dead; its shape resembles that of a temple in ruins but in reality was a ‘desired’ effect of the architect who projected it. I walked along the road that led me, a bit out of breath, to the entrance at the summit. If it hadn’t already been clear enough, at that moment I understood why it would have been nearly impossible to conquer Dunnottar Castle by land. In order to fully appreciate and enjoy the visit, I suggest spending at least an hour and a half; even though most of the site is predominantly made up of ruins, all of the surroundings and panoramic views offered deserve the right amount of time. The Chapel of the English Massacre. After passing below the grand archway that leads to a green clearing, one of the most symbolic places of the castle is the Chapel where the legendary William Wallace enclosed the English soldiers and set fire to it, destroying almost all of the original building. The present ruins belong to the temple built in the sixteenth century by the Earls Marischal family, one of the most powerful of Scotland. Nonetheless, walking among the ruins of the nave and just trying to imagine the sensations of fire that engulfed the ‘helpless hostages’ give you goose bumps. The most imposing building, which can also be seen at a distance, is undoubtedly the Tower House, typical of Scottish castles. It is the most luxurious, containing a sitting room, a private room for the lord and a series of rooms on the upper floor. Unfortunately, I wasn’t able to appreciate it completely as the area was full of scaffolding…I’ll have to wait till next time! Before reaching the other side of the Castle I walked through a series of ruins belonging to another lodging that presently hosts the reproduction of a sixteenth or seventeenth century garden. I finally arrived at the “Quadrangle”, the Modern Palace. It was built between 1580 and 1650 and can be considered ‘a palace inside a palace’ with its rooms for servants as well as other sitting rooms. The structure borders the Chapel and overlooks the grassy square where a water cistern can be found. Entering the palace wing it’s possible to go down to the lower floor to observe a series of cells: a scarcely illuminated place that gives you shivers. Outside the ruins and along the perimeter of the wall you can’t help but delight in the breathtaking view overlooking the sea with the noise of the waves that crash against the cliffs. Benches are strategically placed along the path in order to allow visitors a complete view of the buildings that make up Dunnottar Castle. Toilets are plentiful and conveniently hidden among the ruins. During the summer period, from June to mid September, a bar/cafeteria lorry is situated near the car park. 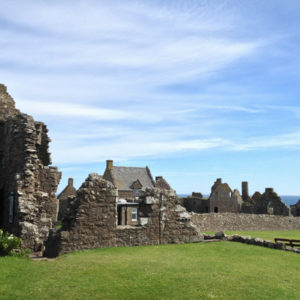 The Castle is located a couple of miles from Stonehaven and about twenty south from Aberdeen. Car transport is the most convenient but remember that the car park is not particularly big and tends to fill up during warm summer days. 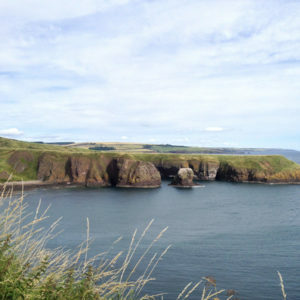 Alternative transport also exists – it’s possible to walk the two miles from Stonehaven leaving from the town and following a path along the coast with distant views of the Castle. This way you can also see the “War Memorial” up close. You can also arrive in Stonehaven from Aberdeen by bus and/or train. Here is the map, found on the Castle website, to follow the walking itinerary and transport options. All in all it sounds like Stefano enjoyed a brilliant day out exploring Aberdeenshire and our Scottish Castles on his wider tour of Scotland. If you would like to read more about Stefano’s travels around Scotland and Italy then you can join him here at checkinblog.it. And if his adventures have inspired you to visit Scotland and explore our unique Scottish Castles for yourself then feel free to get in touch and we’ll be happy to customise a Heritage Hunter tour to suit you.